Miller Brown Used Cars Inc. Started in Edmonton, Kentucky in 1956. 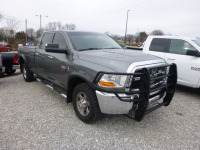 The Business grew and became a large well respected Auto & Trailer Dealer in South Central Kentucky. My Great Grandfather was one of the founding owners and my grandfather & father followed in the business. I am the 4th generation to be involved in the auto business. I started with Miller Brown Used Cars Inc. in 1992. In Jan of 2014 Miller Brown Used Cars Inc. partnership was dissolved. One partner retired one remained in Edmonton, Kentucky and I moved to Glasgow, Kentucky. The new business name became Miller Brown Trailer Auto LLC. We are a new business in a new location but with rich heritage of honest & reliable customer service and sales. We Specialize in affordable Trucks and Cars. We are a authorized New Trailer Dealer for many lines. Let our Experience & hard work help you get the product you need. Call us at (270) 629-5181 to learn more. "We believe that a hand shake means something here "
Jeff has been doing business since 1993. "You can count me telling you like it is. I will work to get you the best deal in town "